From the worldwide experts in windshield technology (that would be us) come two products to help you get more miles out of your windshield and to help it do its job more effectively in all kinds of weather conditions. Shield Wash™ and RainZip® are special formulations made in our own chemical lab and tested for effectiveness with our own Tantec® Contact Angle Meter. It's the stuff we use on our own bikes – and we're hard to please. Want bugs and grime on your windshield to melt away? Who else but the premiere motorcycle/scooter windshield manufacturer could develop the premiere windshield cleaner? Developed by our in-house chemist, National Cycle's N1401-01 Shield Wash™ keeps your windshield ultra clean. It's also great for helmet faceshields and goggles, and safe on practically any polycarbonate or acrylic windshield on the market. To keep your windshield clearer in rainy weather, National Cycle developed N1410-01 RainZip®, a specially formulated rain repellent treatment that is safe to use on your Quantum® hardcoated National Cycle Windshield. And, it's safe to use on ANY motorcycle/scooter windshield, plus helmet faceshields and goggles. RainZip is hydrophobic – when rain accumulates on your windshield, RainZip will cause it to effectively bead up and blow away, even at riding speeds of only 20-30MPH. Shield Wash™ gives you everything you need to keep your windshield sparkling clean! Our kit includes an 8-oz. bottle of Shield Wash and a 1-oz. refillable travel bottle along with a small microfiber cloth to carry with you. RainZip® will give you a clearer view of the road ahead... especially when it's wet! Available in a 3-oz. 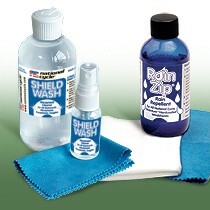 size with application cloth – enough to keep your windshield clear and rain-free for a long time. 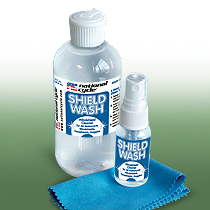 N1401-01 Shield Wash™ kit includes an 8-oz. bottle of Shield Wash, a 1-oz. refillable travel bottle, a small microfiber cloth, and cleaning instructions. 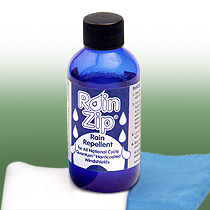 N1410-01 RainZip® includes a 3-oz. bottle, a special application cloth, and application instructions. 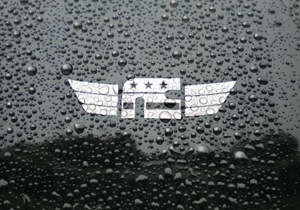 Keep your windshield clean and clear – even in the rain – for a better view of the road ahead.